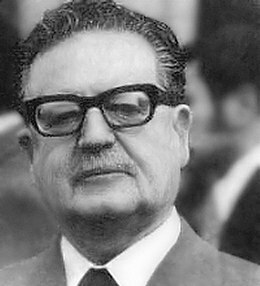 B’ e Salvador Allende Gossens (Valparaiso, 26mh An t-Ògmhios 1908 - Santiago de Chile, 11mh An t-Sultain 1973), lighiche agus neach-poileataigs às An t-Sile. Chaidh e a thaghadh ceann-suidhe ann an 1970, an dèidh na taghaidhean nàiseanta is e os cionn co-bhann leis an canadh Aonachd Phoibleach (Spàinntis: Unidad Popular). B’ fheudar dha a bhith an dùthaich a stiùireadh gu ruige deireadh 1976 ach thug An t-Arm, daoine an làimh dheis agus Na Stàitean Aonaichte ionnsaigh airsan air an 11mh An t-Sultain 1973, is chuir sinn crìoch gu h-obann dha na h-atharrachaidhean sòisealta a bhathar a’ cur air dòigh aig an àm. Chaochail e is An t-Arm a’ leigeil bomaichean air Lùchairt a’ Chinn-suidhe. Chuir e làmh na bheatha fhèin nuair a bha e air a chuairteachadh leis na Feachdan Armachd, is e a’ dìon an Riaghaltais gus a bhàsaich e. Rinn an saoghal air fad bròn leis cho gaisgeach is cho truagh ‘s a bha sin. Fhuair e am Duais Christa Leem ann an 2007 agus an Duais Lenin ann an 1972. Tha nighean a’ bhràthar, Isabel Allende, uabhasach ainmeil gus an latha an-diugh mar ùghdair. Air a tharraing à "https://gd.wikipedia.org/w/index.php?title=Salvador_Allende&oldid=533896"
Chaidh an duilleag seo a dheasachadh 24 dhen Iuchar 2017 aig 19:24 turas mu dheireadh.